Every 6-12 months, as needed. Enhanced aerobic biodegradation is the practice of adding oxygen to saturated soil and groundwater to increase the number and vitality of indigenous microorganisms able to perform biodegradation. Oxygen is considered by many to be the primary growth-limiting factor for hydrocarbon degrading bacteria. Natural sources of dissolved oxygen are quickly depleted when petroleum hydrocarbons are released into the subsurface, thus the natural attenuation of petroleum hydrocarbons in untreated, oxygen-depleted aquifers is slow. By providing oxygen into the subsurface, remediation practitioners can accelerate naturally occurring aerobic biodegradation rates 10-100 times. Enhanced aerobic biodegradation is typically used to treat low to moderate levels of contamination. 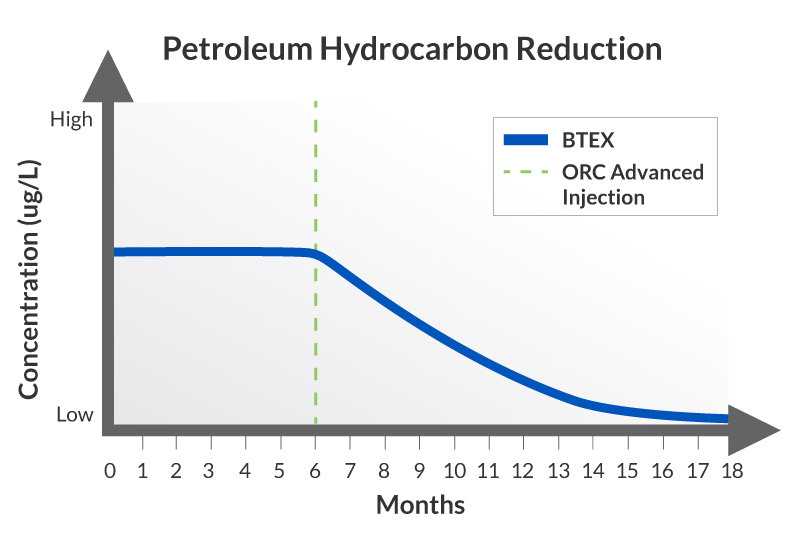 The most commonly treated compounds treated with enhanced aerobic bioremediation are petroleum hydrocarbon constituents (BTEX, PAHs, TPH) and fuel oxygenates and related compounds (MTBE, TBA). When it comes to high petroleum hydrocarbon levels, many remediation practitioners use enhanced aerobic biodegradation in conjunction with more potent treatments such as in situ chemical oxidation (ISCO). Once the hydrocarbon contamination levels have been significantly reduced through ISCO, a transition can be made to enhanced aerobic biodegradation to treat the lower-level, more widely dispersed contaminants. REGENESIS welcomes the opportunity to provide you and your team with the tools you need to successfully plan and execute your next enhanced aerobic bioremediation project. Is enhanced aerobic biodegradation the right solution for your contamination concern? Find out here. Have a look at our track record with enhanced aerobic biodegradation with Case Studies. What is Enhanced Aerobic Biodegradation? Enhanced aerobic biodegradation is the practice of adding oxygen to saturated soil and groundwater to increase the number and vitality of indigenous microorganisms able to perform biodegradation. Oxygen in the subsurface accelerates naturally occurring aerobic biodegradation rates 10-100 times. Enhanced aerobic biodegradation is typically used to treat low to moderate levels of contamination, typically petroleum hydrocarbon constituents, fuel oxygenates, and related compounds. What kinds of microorganisms are used in bioremediation? Microorganisms used in bioremediation include various types of bacteria and fungi. Bacteria are the most common microorganisms used because of their diversity and resilience. How can microbes be used to clean up oil spills? Microbes can be used to clean up oil spills by breaking down hydrocarbons, a main component of crude oil, and harnessing that energy to survive and multiply.